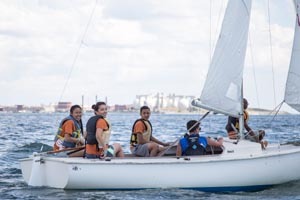 Steps To Lead is a 6-Step summer sailing program in which students progress over multiple years from our 1-week “Learn-to-Sail” step, through 3-week advanced steps, and become eligible by age 15 for a 7-week paid Instructor-in-Training program. Swim Sail Science is a 5-week summer program for Boston children that blends sailing and swimming lessons with academic support and hands-on marine and physical science. Through this 7-week summer job-training program, students make the transition from student to instructor, developing their abilities to teach, lead, and inspire the next generation of Courageous kids. One and two week courses for beginner and intermediate students who are current residents of the City of Boston. Open to ages 8 and up. One and two week courses in Dorchester for beginner and intermediate students. Open to ages 8 and up. Summer Youth Program lottery registration is open March 1st through 15th.